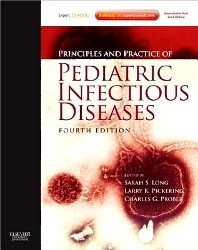 In print, online, or on your mobile device, Principles and Practice of Pediatric Infectious Disease provides the comprehensive and actionable coverage you need to understand, diagnose, and manage the ever-changing, high-risk clinical problems caused by infectious diseases in children and adolescents. With new chapters, expanded and updated coverage, and increased worldwide perspectives, this authoritative medical reference offers the latest need-to-know information in an easily-accessible, high-yield format for quick answers and fast, effective intervention! Spend less time searching thanks to a consistent, easily-accessible format featuring revised high-yield information boxes, highlighted key points, and an abundance of detailed illustrations and at-a-glance tables. Be prepared for the unexpected! A veritable "who's who" of global authorities provides practical knowledge to effectively diagnose and manage almost any infectious disease you may encounter. Quickly look up the answers you need by clinical presentation, pathogen, or type of host.